Hello everyone!! I hope you are all having a great week, and getting ready for the weekend which is fast approaching. I had to work last weekend, so I am looking forward to getting this one off. I’m hoping to get out there and take some pictures in my free time. I thought I would mix things up a bit and put a monochrome image up today. I love black and white, when it’s done right. The truth is, I try to convert a lot of images to monochrome, and I am seldom happy with my results. Color is a seductive force in photography. It can cause us to miss the basic structure of an image as our eyes drink in all that flavorful color. Monochrome gives us no such pleasure. It calls on us to compose wisely, and pay attention to the tonality of the image, that is, not the color, but the brightness values. It forces us to seek out contrast and geometric form, and capture it in a way that brings relevance to the image. It is no small feat. Most of my monochromes that are successful, are so because these things found themselves in the picture through good fortune, and not planning. In other words…sometimes even a blind squirrel finds a nut. I’ve been working on it though, and hopefully I’m beginning to “see” in black and white. What’s your biggest challenge with black and white? Do you like black and white? I know it’s not everyone’s cup of tea as they say, but I love it. My inspiration for achieving good monochrome is owed to my fascination with Ansel Adams, the Master. He had a vision that was second to none. Not only was he an exceptional photographer, but he was a gifted processor of his images, and used these skills to achieve his final vision for every picture he took. In fact, his teachings on vision and pre-visualization are part of why this blog is known as Vision and Pixel. This shot is from my family’s recent trip to New York. 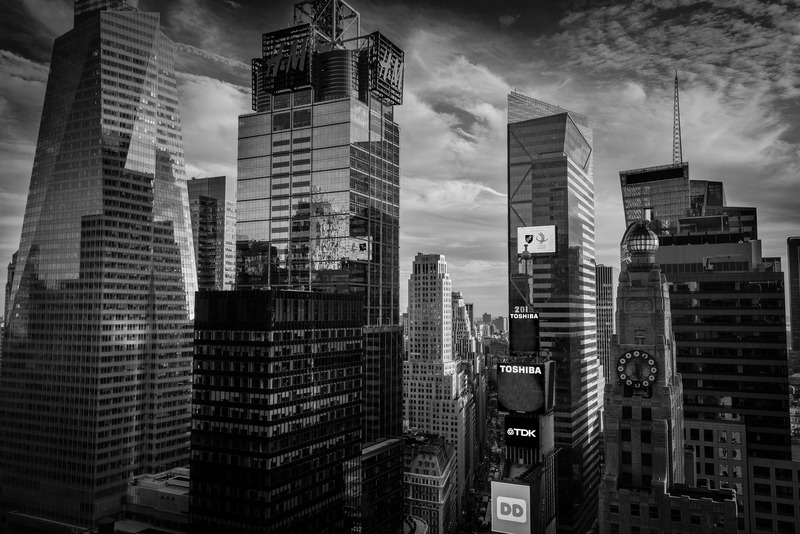 I posted the pano I shot in Times Square already. This shot was taken after spending the day running around Midtown Manhattan shopping and taking in the sights. We stopped by the hotel room the get ready for the evening’s activities, and as luck would have it, it also happened to be golden hour. The sky was awesome, and the buildings had their sunward facing sides lit up with a golden hue. It was awesome. You can actually see “The Ball” that drops on New Years eve just above the Toshiba sign at the top of it’s pole. It was an amazing view out of our 38th floor room. I shot pictures like a crazy person whenever we were there.